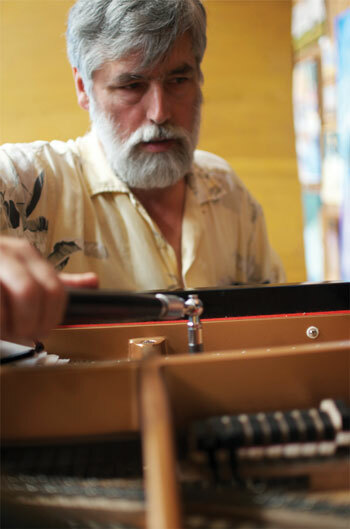 When Curt Spiel sets out to tune the Steinway grand piano at the Methow Valley Chamber Music Festival, he can avail himself of a nearly infinite number of adjustments for those 88 keys. Most keys allow 39 different adjustments, although the top 28 notes, which don’t have dampers, have a mere 34 options. And most notes have multiple strings – 236 in all – which Spiel needs to tweak so they vibrate in unison. Fortunately, Spiel knows these Steinways – and how they respond to weather and humidity – intimately. While there are high-tech machines and smartphone apps for tuning, Spiel, like most registered piano technicians, relies primarily on his ears. The machines come very close, but they make small errors, he said. “You can do it by math given certain parameters, but when you put paper calculations into a real piano, the physics don’t work,” he said. Modern pianos are based on a design developed in the late 19th century, and Spiel still uses the first written instructions for tuning from 1919. Tuning for the music festival, with its outdoor setting and mix of performers, presents unique challenges. Some musicians want customized tuning – Spiel recalls a bassoon soloist who wanted micro-variations in the relationships between notes. The festival is in a barn, where temperatures and humidity fluctuate throughout the day. As the humidity rises, the action on the piano swells, making the piano sharp. Hotter temperatures drive pitches flat. But none of this happens in a consistent way across the keyboard, said Spiel. Nevertheless, conditions have stabilized since Spiel first started tuning pianos for the festival in 2001 – in a meadow in Mazama. The most extreme conditions were an overnight temperature of 38° that had spiked to 105° by the time Spiel arrived to tune the piano for the evening concert. Although temperatures in Signal Hill Barn are more constant, on concert days Spiel starts work at 6:30 a.m. for the morning rehearsal. By the afternoon, the piano has gone flat, and he tunes it again. Each tuning takes about two hours. Spiel will even do an occasional touch-up at intermission if the temperature has varied a lot. “It’s a formidable responsibility – the piano can’t be badly out of tune,” he said. Still, performers tend to be generous because they know an outdoor venue can wreak havoc on the piano, he said. After almost two decades with the festival, Spiel is considering winding down. Omak-based piano tech Jonathan Owens will tune the piano for some festival concerts this summer. “I want to do other things that time of year,” said Spiel, who’s based in the Seattle area and will continue tuning pianos there. He’ll also remain deeply involved with music, playing the piano casually and listening avidly. Classical music is his first love – Spiel remembers listening to it on AM radio when he was just four years old. The Methow Valley Chamber Music Festival runs from July 26-Aug 4. For detailed concert information and to purchase tickets, visit www.methowmusicfestival.org.